Kepco's DIN rail power supplies offer a broad range of features, output voltages and power. In addition to the standard single output supplies commonly available in 24V and 48V outputs, Kepco's DIN Rail supplies offer voltages from 3.3V up to 400V. Our programmable DIN rail power supplies offer an array of output voltages and features not commonly available in DIN rail power supplies. Programmable output voltages range from 0-6 volts DC to 0-400 volts DC. Output power ranges from 50 watts to 3000 watts. Kepco also offers fault tolerant, redundant DIN rail power supplies that feature active current sharing and fault tolerance to ensure high system availability. Other features include remote error sensing, multiple status indicators and flags. The photo at near left shows the assembly of a typical mounting kit to the power supply. 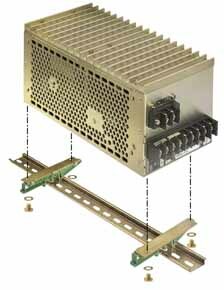 Mounting hardware is supplied to install the preassembled mounting clips on the power supply. Some models are first attached to a mounting plate or bracket before installation of the clips. Once the kit is installed, the power supply can be snapped onto the DIN rail. Each kit includes clips, brackets and hardware. Kits for PC card or open frame power supplies include an enclosure. Cables are included for those models that use input/output connectors. We can supply DIN Rail mounting kits for customer retrofit of previously purchased models, as well as provide fully assembled DIN mountable power supplies ready to be snapped onto a DIN rail. We also have flexibility to tailor DIN based solutions to specific customer requirements including mounting orientation, different connectors, different outputs, configuration for N+1 redundancy and current sharing. 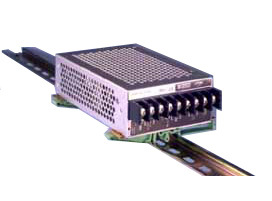 (1) DN and DV models are designed for DIN Rail mount: no suffix, no Kit needed. (2) For hot swap applications, see Series HSP. (3) For S and VS options, check Minimum Clearance requirements.